Will Viso signing affect Andretti Autosport chemistry? Like so many other IndyCar fans, I’d been hearing about The Yellow Party for years but had never had a chance to attend one myself. When I found out that I was going to be in town early enough on the 500 weekend to make it to this year’s party in Indianapolis, I snapped up the opportunity to be there and learn more about what these events are all about. 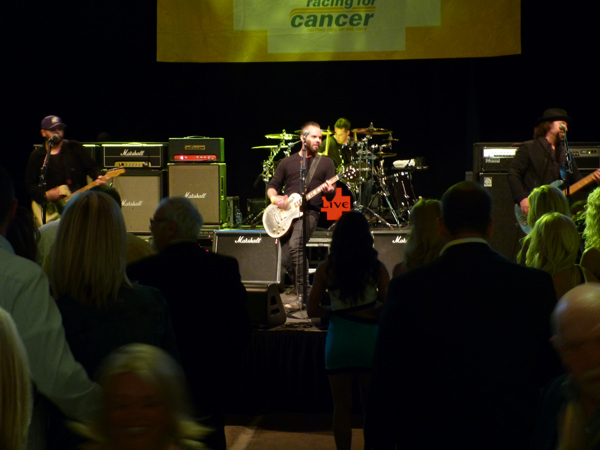 I went in with a rough idea of what to expect: a silent auction, some drivers hanging around – most likely from Andretti Autosport, the team of Indianapolis 500 winner Ryan Hunter-Reay whose Racing for Cancer charity provides the impetus for these events – and a concert by multi-platinum rock band LIVE. Little did I know that The Yellow Party is so very much more. First off, this was no run-of-the-mill silent auction. There were several hundred items on offer, including signed race-worn gear donated by members the IndyCar and Mazda Road to Indy paddocks, drivers from Andretti Autosport’s Global Rallycross team, and others; several custom-made fans donated by Indianapolis company Fanimation decked out in Andretti Autosport driver colors; products and gift certificates for services donated by Indianapolis-area businesses; a LIVE discography signed by the band, and much, much more. It was all controlled via an electronic bidding system that was able to notify you immediately if you were outbid and tell you if you had won after the auction closed, all via your cell phone. This photo does not do justice to the enormity of The Yellow Party’s silent auction. It expanded far beyond this, and the items on offer were a motorsport collector’s dream. While that was ongoing, there was plenty of excellent food to sample and an open bar to enjoy – fully stocked with Snapple Group products, of course. Plus, there was a long list of drivers milling about, and most of them were very involved in interacting with guests and make sure they were having a great time. I kept a running list of the people I saw come and go throughout the evening. Of course, most prominent were the Andretti teammates: Ryan Hunter-Reay and his wife Beccy; Marco Andretti; James Hinchcliffe and his girlfriend Kirsten Dee; and Carlos Munoz. Also noted to be in attendance at various points were Tony Kanaan; Scott Dixon; Jacques Villeneuve; JR Hildebrand; Ed Carpenter and his wife Heather; Mike Conway; Jack Hawksworth; Oriol Servia; Townsend Bell; Stefan Johanssen; USF2000 teammates for ArmsUp Motorsports Aaron Telitz and Peter Portante; Bryan Clauson; Andretti GRC driver Scott Speed; and last but not least Pippa Mann, who went to the trouble of making special arrangements with her Indianapolis 500 sponsor Susan G. Komen, another cancer charity, to ensure she was able to attend without conflicts. 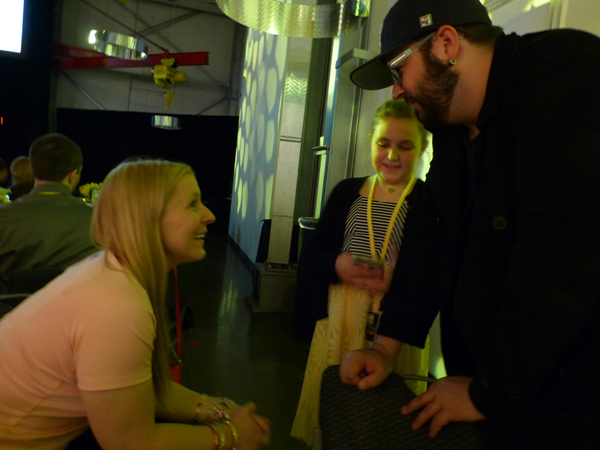 Here, Pippa Mann meets Chad Taylor of LIVE and his daughter, who it turns out is a very big fan of Pippa’s! 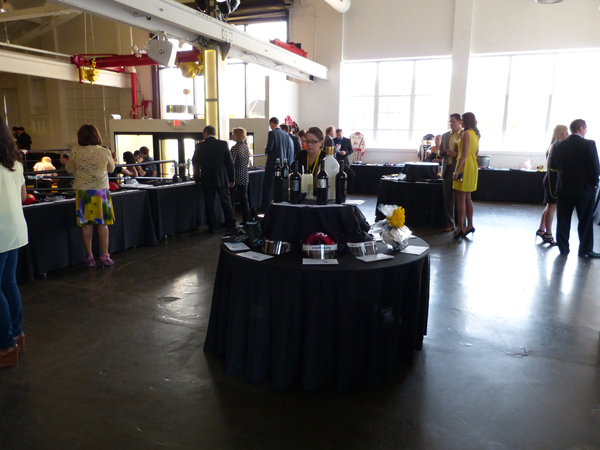 After a couple of hours of enjoying the food and conversation – and the lively competition over the silent auction items – the live auction began. 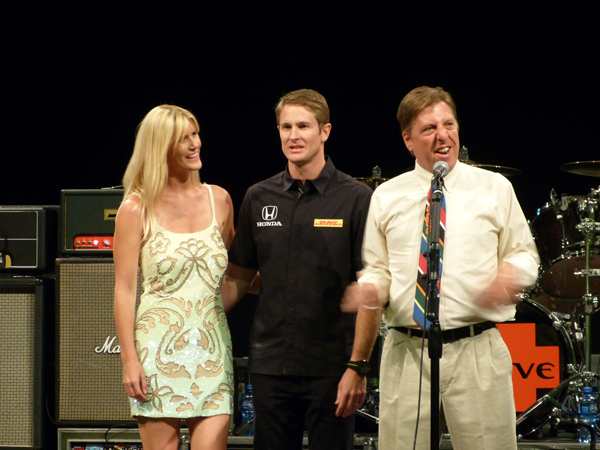 Ryan Hunter-Reay took to the stage beforehand and spoke passionately about how much The Yellow Party has grown in the five years since its inception and how amazing it has been to see the Indianapolis party grow to become a tradition as an opener to the 500 race weekend while making a difference in the lives of the 28 million people living with cancer worldwide. It’s hard to say precisely what the evening’s MC Michael Young was talking about here. Let’s not ask. Among the live auction items available were: a helmet signed by the entire starting field of the 2014 Indianapolis 500; a painting of this year’s Indy front row created live at the party by renowned motorsport artist Bill Patterson; a number of very expensive watches; a custom-built saltwater aquarium; and a specially designed golf cart with a canopy, heated leather seats, and other luxury appointments. This last one was particularly interesting because one lucky auction winner secured the cart that was on site for a winning bid of $22,000, and another attendee ordered a second one on the spot for the same price! 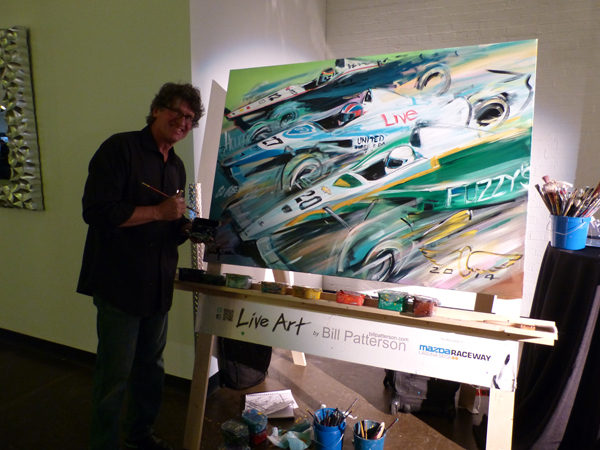 This painting of the front row of the 2014 Indianapolis 500 was created live at The Yellow Party by immensely talented motorsport artist Bill Patterson and was signed on site by Ed Carpenter and James Hinchcliffe. The auction winner was promised that Will Power’s signature would be added to it as well. Once the auctions wrapped up, no time was wasted in getting LIVE on stage. This is where I need to get personal and be a bit of a fan girl. Like many, I’ve been a fan of the band since their biggest single, Lightning Crashes, was released in 1994. My fandom runs a little deeper than average, though, in that I own every album they ever produced – I even have a bootleg sitting around somewhere of the album they recorded in high school before they even called themselves LIVE – and was at one time part of the Friends of Live fan club. As a result, I’ve been to quite a number of their concerts over the years. That being said, I’ve never been to a LIVE gig quite like this. The Crane Bay in downtown Indianapolis is a good size for The Yellow Party, but the stage area was relatively secluded and created a surprisingly intimate atmosphere. I lost count, but I believe they played in the neighborhood of six or seven songs, all but one from among their most popular (the standout being a single from their upcoming new album), and everyone around me was singing along at the top of their lungs just like I was. It was really quite magical – the band wove a spell over the room in that special way that only LIVE can. LIVE performs in their inimitable style at The Yellow Party 2014 in downtown Indianapolis. I left with the sense that I had been a part of something very special – a celebration of IndyCar racing, a chance to hobnob with the stars and at the same time catch up with friends, and a night that culminated in the very successful raising of donations for Racing for Cancer and other Indianapolis-area cancer charities. If you haven’t made it to one of these yet, you absolutely must put The Yellow Party on your bucket list. After you’ve been once, you’ll understand why it’s not to be missed. 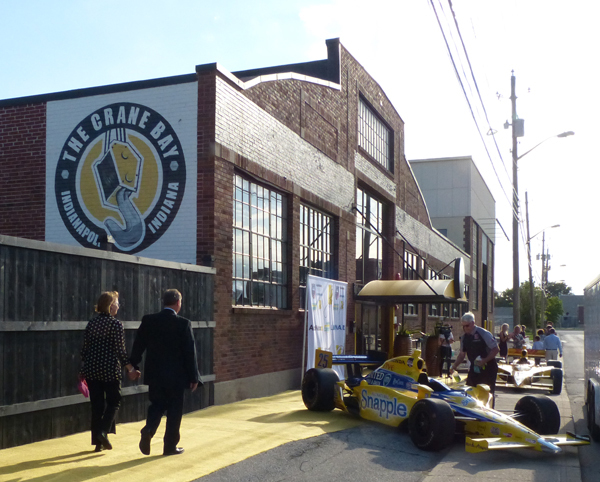 And if you’re headed to the Shell and Pennzoil Grand Prix of Houston, you’re in luck: The Yellow Party will take place at AutoNation Mercedes-Benz of Houston Greenway on Thursday, June 26th from 7:00 to 10:00 PM. The musical performer at that event will be Texan singer/songwriter Kayla Conn, and AutoNation will match every dollar raised for Racing for Cancer at the event. To learn more about The Yellow Party or to purchase tickets, visit theyellowparty.org. Protected by Invisible Defender. Showed 403 to 118,407 bad guys. The painting is really good! How much didnit bring? Copyright © MoreFrontWing.com. All rights reserved. MoreFrontWing.com is not affiliated with any racing series, sanctioning body, stakeholder, or other association or subsidiary. Copyrighted material is employed under Fair Use guidelines. If you are a copyright holder and feel your material has been used unfairly, please contact feedback@morefrontwing.com.